Dos entradas de alto nivel balanceadas. It is a pleasure to announce the "MK-II" version of the FM 255. Providing an ideal combination of symmetrical and unsymmetrical signal handling with an unbeatable price/performance ratio the FM 255 has rapidly become the most successful preamplifier/line stage. 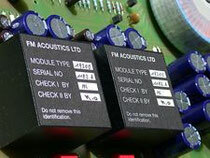 Designed and crafted the FM ACOUSTICS way it never required a single modification or correction since its inauguration! Recently, some parts have become available that in combination with results from extensive research allow the first amelioration since 1995 (!). The refinements manifest themselves in some small modifications but also some more substantial improvements - as described below. New switchable true-impedance attenuators on the balanced inputs. These are very useful with some of today's high level components (CD/DVD players/converters etc.) 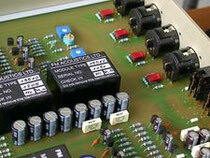 that deliver very high output voltages - often far above the standardized level ratings. Such excessive input levels can overload input stages (not the ones of the FM 255 though...) and they force the user to set the Level control on the line stage to very low settings, so low that it actually works as an attenuator instead of a preamplifier. The new input attenuators lower the excessive levels whilst guaranteeing perfect balancing (not an easy feat). This in turn results in optimal Level control setting (around 12 o'clock position for normal listening levels). To allow optimization of the total system gain - which differs widely from one system to another - further level switches allow tuning of the internal gain of the FM 255-MKII. This allows more flexibility in system gain optimization. Any system can be set to an optimal gain structure - which often improves total system performance. The new "HR" modules (19610) are used on the inputs. 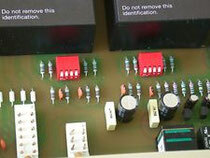 They help to achieve an astounding 100dB of rejection of Common Mode signals (such as interference, hum, noise etc.) making the FM 255-MKII immune against disturbances. This rejection is not achieved with cheap op amps but with a fine-tuned discrete Class A configuration which guarantees the phenomenal resolution FM ACOUSTICS equipment is famous for. 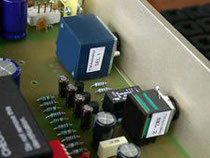 The new "HR" type 19200 modules are employed for the true balanced outputs. These new "HR" modules are the result of a multi-year development. They achieve a superb level of reproduction and reliability. Never before has such a level of accuracy been achieved. To avoid negative influence from spurious resonance and guarantee positive connection the FM 255-MKII employs FM ACOUSTICS' unique resonance-eliminator supports. These isolate the unit from potential resonances which are absorbed and converted into thermal energy. Hand-selected precision Output Level and Balance controls in combination with proprietary interference rejection and shielding/grounding techniques achieve the highest level of musical accuracy. Discrete Class A tape auxiliary send and return guarantees superior recordings and connection to auxiliary equipment. Precision "Balance" and "Output Level" controls guarantee freedom from noise & interference. Internal transformer utilises a special dual shield that prevents stray fields. While this description will give you an initial idea on some of the unique methods and technology, they are not complete and cannot give any idea about the musical accuracy of the FM 255-MKII. To experience this, one must hear the FM 255-MKII. Write to FM ACOUSTICS so our nearest representative may contact you and arrange a demonstration.